Spacious and Private, Waterfront Split bedroom Mediterranean style home in sought after Woodbine community. 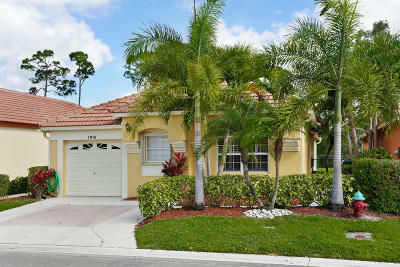 Enjoy the lush tropical views and maintained canal from the screened patio and fenced back yard. Upgraded and impeccably cared for home features a vaulted ceiling open floor plan with custom plantation shutters and hardwood floors throughout the living and bedroom areas. Granite and Stainless kitchen with custom cabinets. Large owner suite and master bath with separate tub and shower. Light and bright throughout. Located in the gated community of Woodbine with amenities. Clubhouse, community pool, tennis courts, bike paths and fitness center.Close to the beach, PBI Airport, Scripps & Max Plank Research Institutes and all Palm Beach County has to offer.